A_Dark brown with ruby red highlights.Thick khaki colored head that dissipates into a thick ring that lasts. Nice lacing. S_Creamy roasty smell. Coffee/toffee. Sweet. T_Sweet cream and chocolate malt. Roast. Nice bitter coffee followed by toffee/caramel. D_Very drinkable low ABV stout. Great example of the style. Pours dark and impenetrable. Full 2 g fingers of head from draft. Smell grains and sugar. Coffee. Chocolate. Very light in the mouth. Not heavy. Definitely a light ABV. Reminds me of Guinness. Lighter. Hints of cream in the mouth. Subtle chocolate and coffee going down. No bitterness. Very drinkable. Won't face plant you. Smooth but leaves me wanting a Founders Breakfast. I'm not as fired up about it as others. Had at a bar in Nanjing. Poured into a pint glass. If you don't like sweet stouts then stay away from this one. One of the sweetest milk stouts I have had. It's a good thing I enjoy them. This one is very smooth and sweet. Cream, chocolate, light coffee but not bitter. Just creamy, sweet and smooth. Not heavy, very drinkable. Will get this again in winter for sure. Smooth and creamy with a velvety finish, no bitterness. Aged 12 oz bottle served in a pint glass. Pours with a large, medium-density tan head over an opaque body. Aroma: perhaps my imagination but some dairy odors seem to join the dark roasted malts. Flavor: slightly sweet: Excellent sweet-bitter balance for style. Some hops and hint of dark chocolate and coffee apparent in the roasty aftertaste. Feel: very smooth, medium body. Well carbonated. (Had both, the normal Milk stout and the Nitro-version, which cannot be reviewed separately.) Poured from 355 mL. Black colored beer, with a light brown frothy head, which is rapidly diminishing. Slightly smooth mouthfeel, texture is a little bit thicker than normal, nearly creamy with a medium body and medium carbonation. Compared to that, the Nitro-version shows a more creamy head (very long lasting) and texture (but not as creamy as expected) and soft carbonation. The milk stout has an aroma of roasted malts (more intensely recognizable than in the Nitro-version), dark chocolate, roasted coffee & slight yeast. Moderate sweet initial taste, light bitter aftertaste. Flavors of coffee and roasted malts, some hints of chocolate. The finish is dominated by coffee flavor and is slightly astringent. The intensity of the flavor and aroma is slightly better in the normal milk stout, whereas the palate is better with the nitrogen added. Overall both very pleasant and enjoyable stouts. L - Dark pour with near 2finger toffee head. Decent retention and nice lacing. T - Yum. All I can say. F - Medium to full body. Smooth. O - What a nice, easy drinking, tasty beer! A: Very dark brown color, almost black. S: Very sweet and chocolate based smell. T: Tastes somewhat of coffee. Very powerful milk sweetness, it'd be hard to not detect the mil flavors in this one. Not enjoying it as much as I thought, but decent if you want a sweet milk taste. M: Heavy mouth feel, perhaps a medium bodied feel for this style of beer. O: Overall, I was underwhelmed. Though, it wasn't bad. 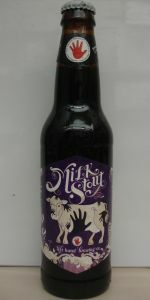 I would definitely recommend this to those who want a sweet milk stout. 12oz bottle bb 10/5/18 poured into a tulip pint glass at fridge temp 6% ABV. The beer pours dense very dark brown with light brown head. The head is minimal and recedes to a film quickly. There is hardly any lacing. The aroma is a mix of roast malt and semisweet chocolate. The taste is mostly semisweet chocolate up front with a roasty bitterness showing up promptly to lend balance. Mouthfeel is medium bodied, lowly carbonated and mostly dry in the finish. The lactose adds a touch of sweetness that keeps it from being totally dry. Overall, good. This is a pleasant enough example of an unadorned milk stout. I don't know anything about beer I just know this is delicious. The first dark beer I've enjoyed. It has great flavor without being overwhelming. It's not bitter or too sweet. L - 2 finger chestnut head atop an opaque dark brown body. S - sugar, chocolate, a little coffee. T - follows the nose. The milk sugar is the most prominent element, but there is some roast to balance things out. Rather sweet, low bitterness, no booziness. F - medium-light body by stout standards. This is the best stout I've had so far. Perfectly sweet, rich in flavor, and fantastically alcoholic. HA! Seriously if anyone can find a better stout, hit me up. The taste is amazing. On tap into a tulip glass. Great tan head and good retention, pitch black otherwise. Smells of typical roasted malts with a touch of chocolate, and the taste is similar with a bit of sweetness. Mouthfeel is absolutely incredible. This is the silkiest, smoothest stout I've ever had, yet it doesn't coat my mouth unpleasantly. Overall, a great feeling beer without a stellar taste to back it up. Still, definitely worth my time. Quick review from a hophead. From tap, after a taste from wife's had to get a pint. Quality beer very similar in look, feel and taste to Guinness. Review is outside after a spicy meal. Good look, nice foam retained throughout. Mouth feel was nice and smooth if you got a little foam, but was a little thin w/o. Overall taste was of a good dark stout, coffee apparent with a smoky ambience, but def not as strong and robust as some others. I can see how others really like this beer and I enjoyed it esp at the start, it just leveled off after. But overall well worth a try or a 6. Poured from 12oz bottle into stout glass. No dating information found. Dark brown colored body, with brown backlit highlights. Half a finger of creamy tan head sticks around. Each sip leaves behind a widely dispersed pattern of lacing. Aroma of roasted malt, coffee, chocolate, and a touch of vanilla. Taste of roasted malt, coffee, and dark chocolate. Provides a little sting to the tongue but no bitterness. Medium to full, smooth mouth feel. Okay carbonation. Very tasty milk stout that brings a smoothness and avoids any sour bitterness. Dark, viscous, yummy, round, bitter sweet. Love stouts and porters, and this is my favorite standard go-to. This is to beer what chocolate cake is to dessert. And incidentally, they taste great together. I absolutely love this beer. I originally bought it to be my Day-Off Beer, but it's great to start a vacation or just to have on the weekends or for dessert. Appearance: Looks black, until you realize it's a dark caramel color tinted few shades of red. Poured into a Pilsner glass with a very thin dark tan head. Very inviting. Smell: You can smell the lactose which gives it a nice sweetness and somehow smells very fresh. It could be me, but I have a hard time pinpointing additional aromas. Mouthfeel: A nice medium to full bodied beer with a lingering heaviness. Taste: The sweetness comes forward, but dissolves to dark coffee. They really work together and balance nicely with the roasted malt. The flavor hangs on your tongue for a long while. Overall: A fantastic beer that I try and keep on hand at all times. Pours a very dark brown, almost black with a one inch tan head that left some lacing. Smells and tastes of roasted malts, milk chocolate, coffee, vanilla and caramel. Lactose sweetness is very evident in the flavor. Medium to full bodied, moderate carbonation, creamy mouth feel. I actually enjoyed this one more than the nitro version I sampled on tap. Dark black color, great head and lingering lacing. Smells of dark rich roast coffee with just a hint of chocolate. Tastes of dark coffee, dark chocolate, caramel and malt with a little biscuit and brown sugar. Moderate mouthfeel, slightly creamy, nice amount of carbonation and smooth aftertaste without bitterness. Very tasty and easy to drink, not overly sweet at all. I had high hopes for this beer. Poured a dark brown with a slight amber hue, not pitch black like some other stouts that I really enjoy. The light brown head made a brief appearance, but quickly subsided, leaving not a trace of sticky goodness on the glass. This beer is not very complex; it's sweet alright, but somewhat thin and watery, and not very aromatic. I don't think I'll pick this one up again.